Aswan is the ancient city of Swenett, later known as Syene, which in antiquity was the frontier town of Ancient Egypt facing the south. Swenett is supposed to have derived its name from an Egyptian goddess with the same name. This goddess later was identified as Eileithyia by the Greeks and Lucina by the Romans during their occupation of Ancient Egypt because of the similar association of their goddesses with childbirth, and of which the import is “the opener”. The ancient name of the city also is said to be derived from the Egyptian symbol for “trade”, or “market”. Because the Ancient Egyptians oriented themselves toward the origin of the life-giving waters of the Nile in the south, and as Swenett was the southernmost town in the country, Egypt always was conceived to “open” or begin at Swenett. The city stood upon a peninsula on the right (east) bank of the Nile, immediately below (and north of) the first cataract of the flowing waters, which extend to it from Philae. Navigation to the delta was possible from this location without encountering a barrier. The stone quarries of ancient Egypt located here were celebrated for their stone, and especially for the granitic rock called Syenite. They furnished the colossal statues, obelisks, and monolithal shrines that are found throughout Egypt, including the pyramids; and the traces of the quarrymen who worked in these 3,000 years ago are still visible in the native rock. They lie on either bank of the Nile, and a road, 6.5 km (4.0 mi) in length, was cut beside them from Syene to Philae. Swenett was equally important as a military station as a place of traffic. Under every dynasty it was a garrison town; and here tolls and customs were levied on all boats passing southwards and northwards. Around 330, the legion stationed here received a bishop from Alexandria; this later became the Coptic Diocese of Syene. The city is mentioned by numerous ancient writers, including Herodotus, Strabo, Stephanus of Byzantium, Ptolemy, Pliny the Elder, Vitruvius, and it appears on the Antonine Itinerary. It also is mentioned in the Book of Ezekiel and the Book of Isaiah. The latitude of the city that would become Aswan – located at 24° 5′ 23″ – was an object of great interest to the ancient geographers. They believed that it was seated immediately under the tropic, and that on the day of the summer solstice, a vertical staff cast no shadow. They noted that the sun’s disc was reflected in a well at noon. This statement is only approximately correct; at the summer solstice, the shadow was only ​1⁄400 of the staff, and so could scarcely be discerned, and the northern limb of the Sun’s disc would be nearly vertical. However, Eratosthenes used this information together with measurements of the shadow length on the solstice at Alexandria to perform the first known calculation of the circumference of the Earth. 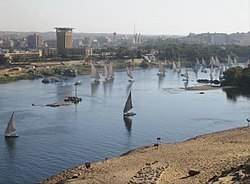 The Nile is nearly 650 m (0.40 mi) wide above Aswan. From this frontier town to the northern extremity of Egypt, the river flows for more than 1,200 km (750 mi) without bar or cataract. The voyage from Aswan to Alexandria usually took 21 to 28 days in favourable weather.